Less than a kilometer from Malaysia’s border with Thailand, the trappings of death are littered across the jungle: a stretcher made of branches to carry bodies, reams of white cloth used to wrap the deceased in Muslim tradition and, most menacing of all, empty boxes for 9-mm bullets. 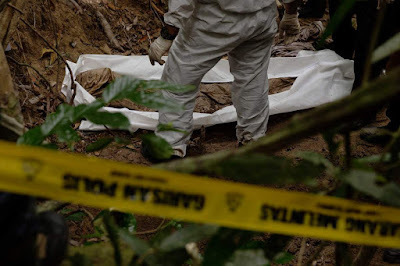 On May 25, Malaysia’s Inspector General of Police, Khalid Abu Bakar, confirmed that there were at least 139 suspected graves strewn across the Perlis range of hills that rise from Malaysia into Thailand, in the vicinity of nearly 30 abandoned camps. How many bodies each possible grave contains is not yet clear, nor is it known how the people may have died. 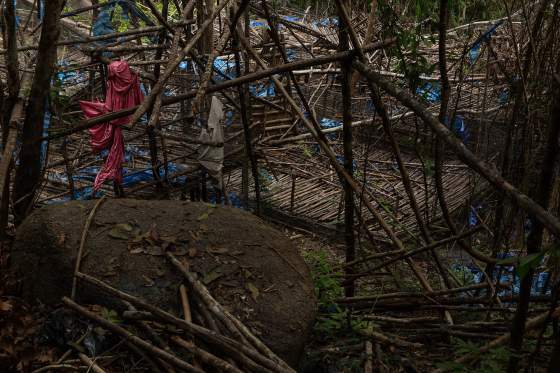 But these remains are believed to be a grim by-product of the human-smuggling trade that for years has transported persecuted Rohingya Muslims from Burma, as well as, increasingly, Bangladeshis desperate to escape poverty back home. For years, desperate individuals have boarded rickety boats to cross the Bay of Bengal and Andaman Sea, then trekked through Thailand’s southern jungles to their ultimate destination: Malaysia. But with the smuggling routes through Thailand into Malaysia disrupted by police investigations, thousands of Rohingya and Bangladeshis are thought by the U.N. to be stuck at sea, as traffickers figure out how to salvage their human cargo and captains abandon the boats for fear of the official crackdown. Around 3,500 Rohingya and Bangladeshis have managed to land in Malaysia and Indonesia in recent weeks, after months at sea. With Southeast Asian governments at first unwilling to take them in, the boats — their holds packed with hundreds of people, like modern-day slave ships — floated between different national waters in what the U.N. described as “human ping pong.” Only last week did the governments of Indonesia and Malaysia officially agree to offer shelter. For now, the suspected graves in northern Malaysia’s Perlis state are marked with lone branches, the earth covered by a scattering of oversized rainforest leaves. On Tuesday, forensic teams — including one that recently returned from Ukraine, the site of the downed Malaysia Airlines jet — began sifting through the soil to recover bodies. It is a process that forensic analysts gathered at a makeshift police encampment in Wang Kelian, a few kilometers from the hill-top burial grounds, say will take weeks, if not months. Only one body was discovered above ground. It was found in a wooden holding pen, the lower part wrapped in the sarong that is commonly worn in Burma and parts of Bangladesh. So badly decomposed was the body that forensic investigators removed it from the site in five separate bags. Malaysia’s suspected burial ground is not the first to be discovered along the porous border with Thailand. Earlier this month, 33 bodies were unearthed in Thailand, less than 500 m from some of the Malaysian suspected graves on the opposite side. Initial police reports indicated that the cause of death for most of the bodies found in Thailand was either starvation or disease. Often, according to TIME interviews with more than 20 Rohingya who have taken the same trafficking route through Thailand into Malaysia, the agreed-upon price for the journey is jettisoned once the victims reach the jungle camps on the border. There, they are essentially held to ransom until family members either back home or in Malaysia pay much higher sums. Food is scarce and beatings common, say survivors. This year, Malaysian police say they have arrested 37 people in connection with human smuggling, including two policemen from the state of Penang. In 2014, 66 people were charged in connection with the trade. But for human traffickers to have operated in border areas with such impunity for so many years — no matter how thick the foliage may be — it’s hard to imagine a complete lack of official complicity. Earlier this month, the mayor and deputy mayor of the Thai border town Padang Besar were arrested. Other local officials in Thailand have been detained. Yet the trade has been going on for years, with the number of Rohingya fleeing Burma (officially known as Myanmar) escalating after Buddhist-Muslim tensions in Rakhine (or Arakan) state exploded in 2012, with the stateless Rohingya bearing the brunt of the violence. Hundreds of this Muslim minority are believed to have died, and around 140,000 have been herded into camps, where disease stalks a vulnerable population. Bereft of their homes and land, many Rohingya see opportunity in Malaysia, a Muslim-majority nation, no matter how hard the journey. Others allege they were kidnapped onto trafficking boats, as the smugglers struggle to find enough people to fill their holds. The traffickers are also targeting Bangladeshis from across the border with Burma; they, unlike the Rohingya, have little hope of ever gaining refugee status in Southeast Asia. So far, Malaysian police have been combing a 50-km stretch of the Perlis jungle. What else will be found in the coming days? Locals speak of ghosts up in the hills by the Thai border. “I thought I would die,” says Dilarah, a Rohingya, of her 38-day journey from western Burma, through the camps on the Thai-Malaysian border. She is 6 years old.